Mr. Justice Athar Minallah in his judgment has decided the issue regarding placement of Accountability Court under trial accused on Exit Control List in Writ Petition No. 1452 of 2018. 1. Through the instant writ petition, the petitioner, Gohar Ullah, impugns the order dated 15.03.2018, passed by the Ministry of Interior (respondent No.1) furnishing the reasons for the placement of his name on the Exit Control List (“E.C.L.”) through memorandum dated 10.01.2018. 2. Learned counsel for the petitioner submitted that the petitioner has been arraigned as an accused in reference No.58/2016 filed by the National Accountability Bureau (respondent No.2) under Sections 18(g) and 24(b) of the National Accountability Ordinance, 1999 (“N.A.O.”) before the learned Accountability Court at Karachi; that the filing of the said reference was approved by the Chairman, National Accountability Bureau (“N.A.B.”) at Islamabad on 30.11.2016; that the petitioner was arrested on 19.08.2016 and remained in the custody of N.A.B. till 29.10.2016; that vide order dated 29.03.2017, the petitioner was granted bail by the Hon’ble Supreme Court; that the petitioner is regularly attending the proceedings before the learned Accountability Court; that the Hon’ble High Court of Sindh has passed an interim order dated 29.05.2014 in favour of Fateh Textile Mills Limited. ; that the petitioner’s name was placed on the E.C.L. on the recommendations of N.A.B. ; that vide order dated 06.02.2018, passed by this Court in writ petition No.439/2017, respondent No.1 was called upon to decide the petitioner’s representation for the removal of his name from the E.C.L. within thirty days; that the reasons furnished by respondent No.1 for not removing the petitioner’s name from the E.C.L. 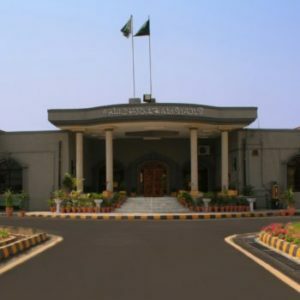 are not sustainable in law; that on account of a pendency of a reference against the petitioner, his fundamental right to travel abroad could not be curtailed; and that in the case of Dr. Joseph Wilson Vs. Federation of Pakistan (2017 PCr.LJ 1569), this Court had held that the mere pendency of a reference before an Accountability Court is not a valid ground for placing an accused name on E.C.L. Learned counsel for the petitioner prayed for the writ petition to be allowed in terms of the relief sought therein. 3. On the other hand, learned Deputy Prosecutor-General, N.A.B. submitted that the petitioner was involved in the commission of corrupt practices causing a loss of Rs.2.503 billion to the national exchequer; that the petitioner has made efforts to protract the proceedings before the learned Accountability Court; that there is an imminent apprehension that in the event the petitioner’s name is ordered to be removed from the E.C.L., he will abscond and frustrate the proceedings before the learned Accountability Court; that the petitioner is the Chairman and Director of M/s Fateh Textile Mills Limited (“F.T.M.L.”); that in the year 2005, an area measuring 8626 acres was leased to F.T.M.L. for the purpose of installation of a 200 mega watt coal fired power plant for a period of thirty years; that instead of installing a power plant, the petitioner extracted coal from the said area and sold it in the market; that the petitioner in doing so caused a loss of Rs.2.503 billion to the national exchequer; that the petitioner is also under investigation for fraudulently obtaining an export rebate of Rs.4,745,346/- against fake bank credit advices and also obtaining a fraudulent sales tax refund of Rs.171,008,072/- on the basis of fake invoices; and that the petitioner has already been denied one time permission to go to China in December, 2018. Learned Deputy Prosecutor-General prayed for the writ petition to be dismissed. 4. We have heard the contentions of the learned counsel for the petitioner as well as the learned Deputy Prosecutor-General, N.A.B. and perused the record with their able assistance. 5. The petitioner, who has been arraigned as an accused in reference No.58/2016 filed by respondent No.2/N.A.B. under Sections 18(g) and 24(b) of the N.A.O. before the learned Accountability Court at Karachi, seeks a direction to respondent No.1 for the removal of his name from the E.C.L. 6. As per the contents of reference No.58/2015, a complaint had been filed against the petitioner, who had remained the President of the Hyderabad Chamber of Commerce and a Director of F.T.M.L., for unlawfully selling coal, which had been reserved for a power plant, in the open market and thereby causing a loss to the tune of Rs.2.503 billion to the national exchequer. A coalfield spread over 8626 acres in a compact block in District Jamshoro had been reserved by the Government of Sindh for the generation of electric power. On 15.04.2005, an M.O.U. was signed by parties including the Sindh Coal Authority and the Fateh Group, whereby it was agreed that the latter would develop the coalfield leading to the establishment of an integrated coal fired power plant. The petitioner, who was a Director of F.T.M.L., is alleged to have played an active role in the matter. On 17.05.2005, another M.O.U. was signed between the Fateh Group and the Government of Sindh, whereby the latter was required to install a power plant and start the production of electricity within a period of five years. Pursuant to the provisions of the said M.O.U.s, the said land was leased to F.T.M.L. on 22.06.2006. F.T.M.L. was permitted to sell the surplus coal in the open market after meeting the requirements of the power generation plant. At no material stage, was a power generation plant installed by F.T.M.L. The petitioner had a controlling share in M/s F.G.B.C., which was not a financial institution. Manzoor Hussain Memon, former Director, Mines and Mineral Development Department, Government of Sindh, was alleged to have issued an N.O.C. without the approval of the competent authority allowing F.T.M.C. to mortgage the mines leased rights in favour of any bank or a financial institution. On the basis of the said N.O.C., F.T.M.L. mortgaged the said land with M/s F.G.B.C. for US Dollars 100 million. F.G.B.C. has instituted civil suit No.333/2012 against the Director General, Sindh Coal Authority, etc. Even though F.T.M.L. had not established a power plant, it was unlawfully permitted to sell surplus coal in the open market. Vide letter dated 13.02.2009 from the former Director General, Mines and Mineral Development Department, Government of Sindh, who has been arraigned as accused No.6 in the said reference. Further information regarding the subject matter can be solicited from AUJ LAWYERS. Feel free to contact us in case you need any clarification and/or require legal assistance regarding similar matters. This entry was posted in Case Laws, Constitutional Law, Energy & Utilities, Exit Control List, Fateh Group, Islamabad High Court, Knowledge - Constitutional Law, Litigation & Arbitration, Ministry of Interior, NAB, Solutions - Constitutional Law. Bookmark the permalink.